The major developments of American Jewish history grew out of both a Jewish and an American context. The chronology of American Jewish life, the structure of its communal network, and the inner dynamism that propelled it demand explanations from both American and Jewish sources and cannot be divorced from either of these histories. Yet by itself neither one can explain how American Jews lived and what the patterns of their lives meant to them. A constant process of negotiation shaped the history of Jews in America. Many—probably most—ordinary Jews wanted both to be good Jews and to be full Americans. They looked inward to Jewish tradition to shape the patterns of their lives, while looking outward to their American neighbors as they decided how to live and how to present themselves. They thought about the Jewish past and the American present, trying to determine what each demanded of them. But American Jews did not just react to the actions of non-Jews, the dictates of communal leaders, the sanctity of authoritative texts, or the tumultuous political events at home and beyond their borders. Rather, they actively fashioned their communities, both locally and nationally, according to their understanding of what their Jewish and American identities demanded of them. At times the process of negotiation set them apart from other diaspora Jewish communities, while at other times putting them at odds with the behaviors and attitudes of other Americans. Negotiating between American and Jewish identities, they operated with a sense of empowerment. They did not believe that they had to accept America as it was, nor did they see Judaism as a fixed entity that they could not mold to fit their needs. They could put their impress on both to ease the traumas of accommodation and to bring the two into harmony. The Jewish women and men of America tested the boundaries of Judaism as they understood it, searching for ways to render the traditional system acceptable to their American sensibilities. In matters of religious practice, American Jews looked less often either to canonical works or to authoritative leaders. Rather, they fashioned their religious lives in their own image. American Jewry thus took on a character distinctive from that of other Jewries. The mere fact that they created a derivative society, made up of immigrants, rendered the construction of American Jewish identity fluid, negotiable, and highly voluntary. Jews who emigrated from Poland to Germany, for example, stood out dramatically from the German population because of their foreign origins. They were expected, both by non-Jews and Jews, to subsume their former identities under a German Jewish rubric. By contrast, Polish Jews who immigrated to America came to a country where almost all residents traced their roots to someplace else, and Jews did not stand out as unusual for being immigrants or the descendants of immigrants. They rarely had to hide their Jewishness completely or to erase where they had come from. Yet at times some did conceal or abandon their Jewish identity altogether. For many the demands of America and the burden of Jewishness led to discontinuity, discomfort, and disjunction. For some, the lure of America proved stronger than allegiance to Jewishness. Some left Jewishness behind, dropping out completely from the Jewish world. Their stories, of the occasional great-grandparent in a Christian family who had been born Jewish, the Jewish-sounding surname in a non-Jewish household, and so on, emerged through family histories. Other Jews, from the most observant to the most politically radical, had little interest in America, its values, institutions, and practices. They expressed disdain for what they saw as the shallowness of American culture, the cruelties of its economic system, and the seductive power of its popular culture. But most, from the days of the earliest Jewish communities in America, self-consciously sought to be part of American society, first in the local community and then, after independence, in the national milieu. Their professions of loyalty to America and their actions in the name of the American common good won them friends and allies among their non-Jewish neighbors. American Jews found themselves notable in the history of the Jewish diaspora in that they never functioned as their nation's most stigmatized group. By virtue of their skin color, and through the middle of the nineteenth century by virtue of the fact that they were not Catholics (Irish Catholics in particular) in a fervently Protestant society, they enjoyed a degree of acceptance, however attenuated. That acceptance, as they saw it, existed relative to the tremendous persecution that Jews experienced elsewhere and that some non-Jews experienced in America. From the end of the eighteenth century, at the beginning of the era of Jewish Emancipation in Western Europe, American Jews enjoyed relatively full political and civil rights. They also functioned in a political system in which the state eschewed any interest in the religious lives of its people. And yet anti-Semitism reared its head in America too and left its mark on the Jews. While racist talk did not translate into direct political action against the Jews as it did in Europe, a series of social and governmental policies, culminating in the 1920s in the immigration quota system written into the National Origins Act and the quota systems in colleges and universities, hospitals, and law firms, limited—or eliminated—Jewish entry. This meant that Jews shaped their life choices in part around a set of options informed by the fact that they were Jews. This book describes how the Jews came to America in the seventeenth century and lived in general obscurity, making a point of attracting little attention to themselves and to their differentness. For almost all of their history in America, after Peter Stuyvesant greeted with enmity the first group of Jews on the docks of New Amsterdam in 1654, Jews lived in Jewish communities, which functioned as structures of support. These highly regulated, self-governing, hierarchical Jewish communities were built around a single synagogue in each of five Atlantic coast seaports and in Richmond, Virginia, which sat at the head of the internal waterways that served the Appalachian frontier. These small Jewish communities functioned as American outposts of the Jewish communities of Amsterdam, London, and several others scattered around the Caribbean. They centered on Jewish traditions such as respecting, if not observing, the Sabbath, eating kosher food, and preparing Jewish children for life in a Jewish world. At a more profound level, Jews differed from other Americans by virtue of their identification with a worldwide people. They derived a sense of themselves from their participation in a set of practices whose origins went back millennia, from their reverence—even when not observed—for inherited texts viewed as sacred, and from their identification with people around the world in whom they discerned a commonality of history and fate. After the ratification of the Constitution, although the United States may have operated on the principles of separation of church and state and the nonestablishment of any one religion, many still considered it a Christian country. The basic tone of the society was set by Christian idioms, and the Christian calendar reflected the seasons. But Jews had their own idioms and their own calendars. How they negotiated between the Christian character of America and their own Jewishness provides one of the leitmotifs of their history. From the second decade of the nineteenth century until the second decade of the twentieth, America functioned as a magnet for Jews leaving Europe. The great era of European Jewish immigration to America spanned a century from 1820 through 1924. That successively larger waves of immigrants crested on the shores of the United States meant that Jewish communities always existed in a state of flux. Newcomers intersected with old-timers, who a decade or two earlier had been newcomers themselves. Jewish communities both welcomed and sought to remake the immigrants, who both retained some familiar practices and identities and created new ones as they found a place in their new homes. The era of immigration coincided with two crucial moments in the economic history of the nation. When in the early nineteenth century white America pushed westward and into the hinterlands beyond the Atlantic seaboard to exploit the natural resources of the continent, Jews, as peddlers, small-town merchants, and wholesalers in regional entrepôts, outfitted this westward expansion. When the American economy shifted its focus to the production of nondurable consumer goods in the last quarter of the nineteenth century, Jews, with a long history in the needle trades, came to America in part to operate the sewing machines that helped clothe the American public. The lives of American Jews often deviated from those of other Americans in other ways. Throughout most of American history, until the end of the nineteenth century, most Americans made their living as farmers. The rare Jewish farmers have been noted in communal chronicles because their stories differed so much from the basic American Jewish narrative. Whereas other Americans made a living through agriculture, Jews made theirs through commerce, and by the end of the nineteenth century many worked in industry. Not until the early twentieth century, as revealed in the 1920 census, did a majority of Americans live in cities. Jews, however, all through their history in America, had opted for cities over small towns, especially large cities. The communal histories of small-town Jews in the South, the Southwest, and the Pacific Northwest stood apart from those of most Jews. Likewise, by the middle decades of the twentieth century Jews acquired university educations and entered into the professions far out of their proportion to the population as a whole. The nineteenth century saw not only the triumph of national independence but also the growth of cities beyond their colonial borders and the expansion of the white population into the trans-Appalachian west, the Great Lakes, the Pacific Rim, and then the filling in of the vast prairie regions. Americans liberated themselves not just from Britain but also from many (although not all) of the hierarchies and restraints of the eighteenth century. Likewise, Jews in the older cities, and then in all the new places in which they settled, broke out of the strict structure of a synagogue governing the entire life of the local Jewish community. Clusters of Jews built a variety of synagogues as well as various kinds of extra-synagogal institutions. They experimented with new forms of worship. American Judaism, like America, came to be increasingly pluralistic and accepting of the idea that in matters religious, groups of women and men had the right to create their own institutions as they saw fit. By the end of the nineteenth century, individual Americans issued a call for the creation of new structures to tame the unsettled and disorderly life of the nation, culminating in the Progressive Era and the New Deal of the 1930s. Likewise, individuals in Jewish communities sought to impose order on what they saw as a bewildering welter of Jewish charities, schools, organizations, prayer books, and synagogues. Reform Judaism achieved its institutional form in the late 1860s and 1870s. Conservative Judaism evolved slowly from the Jewish Theological Seminary founded in 1886. Starting in the 1890s Orthodoxy in America began to search for ways to centralize the practice of traditional Judaism. All conformed to the organizational and managerial model of the society as a whole. The rise of federations of Jewish philanthropies beginning in the 1890s and the local Jewish community councils in the 1920s fit with the progressive passion for order as well. If the history of the Jews in the United States paralleled the history of the nation, it also flowed along the course of modern Jewish history in general. As in Europe, Jews in America formed communities that provided a wide array of services to their members, although in America the members always affiliated because they chose to. All the great political and intellectual streams coursing through Jewish life in the modern age traveled in a transnational Jewish path, linking Europe, America, and Palestine (and, after 1948, Israel): Reform, secularization, modern Orthodoxy, Socialism, Zionism, the flowering of Yiddish and Hebrew literature and letters, and the expression of Jewish idioms in new art forms such as theater and film. For much of its history American Jewry functioned as a kind of outpost of Europe. It was in the great Jewish population centers in Poland, Russia, and Germany that Jewish high culture was created. Warsaw, Berlin, Vienna, Odessa, Vilna, and other cities of Europe were the cradles of Jewish political and artistic inspiration, while America was a kind of sideshow. Although these ideas and movements also flourished in New York, Chicago, Los Angeles, and Philadelphia, the basic flow went from east to west. The pivotal moment in the history of American Jewry took place in the crucial years between the middle of the 1920s and the end of World War II. In that two-decade period, a population of Jewish immigrants transformed itself into a population of native-born American Jews. By the eve of World War II a majority of American Jews had been born in America. By the 1960s most Jews in America no longer had a direct link to Europe—particularly Eastern Europe—and to the legacy of anti-Semitism and of densely organized, highly structured Jewish communities. Therefore, it should not be surprising that American Jews articulated, albeit in Americanized forms, similar ideas, sensibilities, fears, hopes, and beliefs as did Jewish people elsewhere. Likewise, regardless of what many Americans liked to believe, American ideas, technological sophistication, and economic fortunes operated in concert with developments in Europe. World War II proved to be the tragic turning point. Not only did it witness the destruction of Jewish lives and communities, but it also heralded the passing of the baton, by default, to American Jewry. By the war's end America became the largest, most significant, and most powerful Jewish community in the world. American Jews played a key role in the reconstruction of Jewish life around the globe, attempting to remake it in their image. They framed that image around the fact that American Jews lived with a high level of physical comfort. Yet, both before and after the Holocaust, the specter of violence and persecution that hung over the heads of their sisters and brothers elsewhere not only shaped their political behavior, it also haunted them. The bonds of shared identity influenced American Jews, causing them to wonder about and fret over their own fate in a non-Jewish land. Indeed, the moments when anti-Jewish and anti-Semitic rhetoric in America rose to audible levels coincided with the great outbreaks of anti-Semitic rhetoric and action in Europe. The kinds of defense organizations that American Jews founded reflected events and developments across the Atlantic as imagined by Jews in America. Economically, American Jews, as compared to European Jews, had access to higher wages and greater levels of material comfort, and at almost any point in time they expected to experience some mobility. But they, like Jews elsewhere, functioned within a specific kind of Jewish economy. The kinds of jobs they pursued, the provision of credit within Jewish networks of assistance, and the ways in which new fields using technological innovations opened up to them took place in Europe as well, and immigrant Jews coming from America went from one Jewish economy to another. When measured alongside other Jewish communities, American Jewry ought to be seen as sui generis up to World War II. Yet since the end of the war and the tectonic shifts in Jewish life that resulted from it, American Jewry has become paradigmatic of the diaspora communities almost everywhere else. Before the war, American Jewry stood out among Jewish communities for its freedom to shape its internal institutions, with no interference from the state, and for its high level of integration into the larger society. The relative absence of anti-Semitism, which manifested itself in organized political action, also shaped the contours of American Jewish life, rendering it different from other Jewish communities. American Jewry emerged as distinctive because of its own internal tolerance and pluralistic views about Judaism and Jewish practice. With the end of World War II American Jewry emerged as the dominant center of diaspora Jewish life. It began to function as a model for the older communities, which had been shaped by long histories of anti-Semitism, political struggles over emancipation and the problematic status of the Jews, and the state's meddling in the inner life of the Jewish community. By the end of the twentieth century the older Jewish centers pursued strategies, allowed for pluralism, and engaged in debates that mirrored what American Jews had been doing for decades, indeed centuries. The era from the 1930s through the 1960s thus might be seen as both the golden age of American liberalism and as the enshrinement of the legacy of the New Deal and the high point of Jewish institutional orderliness, which followed the move of American Jews out of the central cities and into the new suburbs of the postwar era. The late 1960s, however, brought about severe internal criticism of that quest for order and the triumph of bureaucracy. Many, especially students, took America to task for its continuing racism and sexism. Likewise, a Jewish counterculture, embodied in the havurah movement, chided the suburban synagogues for what young people saw as their parents' shallow compromises with American bourgeois civility. The issue of women's rights within Judaism challenged the denominations and the community institutions, and the specter of the Holocaust and the charge that American Jews had failed to react in the face of its horrors left their mark on the Jewish communities. The rise of a new kind of Orthodox Judaism that questioned the kinds of adjustments Jews and Judaism had made to America took place in the context of late-twentieth-century America, which became more tolerant of displayed differences. American Jews faced the beginning of the twenty-first century with a sense both of comfort and concern. Before them lay seemingly limitless choices in their personal lives and in the kinds of Jewish practices and idioms they could fashion for themselves. Yet they also saw a dwindling of numbers and a weakening of group loyalties. Much of their communal time went into discussions and debates over these two, possibly irreconcilable, trends. How they will play out surely cannot be hazarded by anyone, a historian in particular. The year 2000 offers a convenient ending point to this narrative. On the one hand, the fact that the Democratic party nominated for vice president an observant Jew, Joseph Lieberman, deserves to serve as the terminal point of this history of nearly 350 years of Jewish life in America. In the days and months following Lieberman's nomination the American public became quite familiar and, by all accounts, comfortable with the fact that on Saturdays the candidate took a rest from the frenetic pace of campaigning to observe the Jewish Sabbath. In the early fall, the high point of the campaign, he observed a cycle of holidays that set him apart from the vast majority of Americans, the electorate who would in November decide his political fate. Press accounts and opinion polling demonstrated not only that Americans did not harbor negative feelings about Lieberman's Jewishness, but indeed that they respected and admired his faith and commitment. They did not see him as somehow less than fully American. That same autumn witnessed the start of a new and deadly cycle of violence in Israel. The outbreak of bloodshed in the region, the spread of anti-Israel rhetoric around the world—including on some American college campuses—caused American Jews grave consternation. They were torn and tormented by the grim news coming out of the Middle East. The fact that criticism of Israel had melded with frightening ease in parts of Western Europe into familiar, old-style anti-Semitism shocked the American Jewish public. While American Jews debated, with great intensity, about what role they, Israel, and the United States government ought to play, they could not but be struck by the contrast between France, for example, and the United States, where with a few isolated exceptions, public support for Israel remained high and where mobs did not attack Jewish communal institutions. Whatever their political opinion about Israel, or indeed about any subject, they saw graphically how America and its had Jews created a very special relationship. Since Peter Stuyvesant greeted with enmity the first group of Jews to arrive on the docks of New Amsterdam in 1654, Jews have entwined their fate and fortunes with that of the United States—a project marked by great struggle and great promise. What this interconnected destiny has meant for American Jews and how it has defined their experience among the world's Jews is fully chronicled in this work, a comprehensive and finely nuanced history of Jews in the United States from 1654 through the end of the past century. 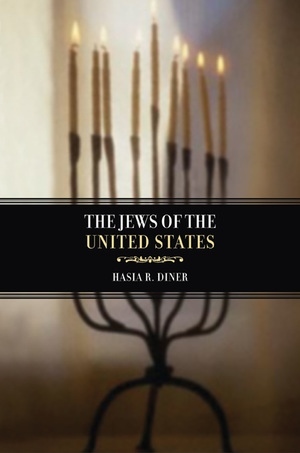 Hasia R. Diner traces Jewish participation in American history—from the communities that sent formal letters of greeting to George Washington; to the three thousand Jewish men who fought for the Confederacy and the ten thousand who fought in the Union army; to the Jewish activists who devoted themselves to the labor movement and the civil rights movement. Diner portrays this history as a constant process of negotiation, undertaken by ordinary Jews who wanted at one and the same time to be Jews and full Americans. Accordingly, Diner draws on both American and Jewish sources to explain the chronology of American Jewish history, the structure of its communal institutions, and the inner dynamism that propelled it. Her work documents the major developments of American Judaism—he economic, social, cultural, and political activities of the Jews who immigrated to and settled in America, as well as their descendants—and shows how these grew out of both a Jewish and an American context. She also demonstrates how the equally compelling urges to maintain Jewishness and to assimilate gave American Jewry the particular character that it retains to this day in all its subtlety and complexity. Hasia R. Diner is Paul S. and Sylvia Steinberg Professor of American Jewish History at New York University. She is the author of Lower East Side Memories: The Jewish Place in America (2000), Hungering for America: Italian, Irish, and Jewish Foodways in the Age of Migration (2001), and, with Beryl Benderly, Her Works Praise Her: A History of Jewish Women in America, 1654 to the Present (2002).